New York has made huge improvements to its walking/cycling infrastructure in the past five years, adding bike lanes, car-free zones, and greenways throughout the city. 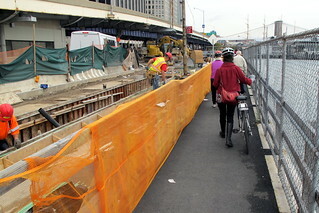 When we visited in 2007, the first bike lanes were just being built in Manhattan, and few cyclists braved the streets. 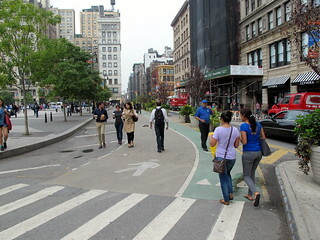 Five years later, Times Square is a pedestrian-only zone, the High Line is all the rage (more on that in a later post), separated bike lanes cut across Manhattan, and cyclists are everywhere. 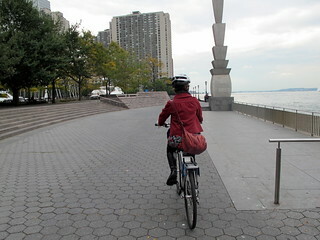 I was really excited to bike around New York and experience all the improvements firsthand. 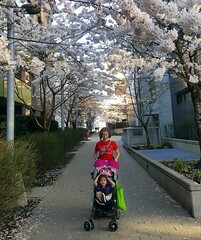 We rented bikes one day, and, unfortunately, had a terribly disappointing experience – the weather, construction, and cost all conspired against us. New York’s bike share program was supposed to be operational during our visit, but was delayed until March 2013. That forced us to rent expensive tourist bikes for $25 each for only 2 hours. The staff at Bike and Roll were almost useless on providing advice on where to go and sent us off with a map that promised separated bike lanes, but didn’t mention that large stretches were under construction and a mess to navigate. 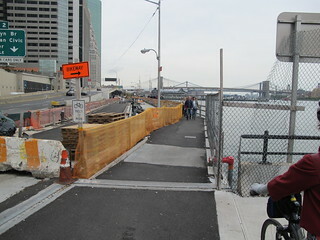 After we got through the construction under the FDR Expressway, we made the mistake of following the signs for the Brooklyn Bridge. 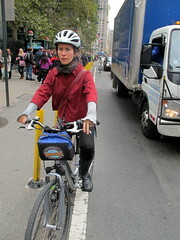 The bike route to the foot of the bridge lead us down congested streets in the financial district without any bike lanes. It got especially hairy near the 9/11 memorial. 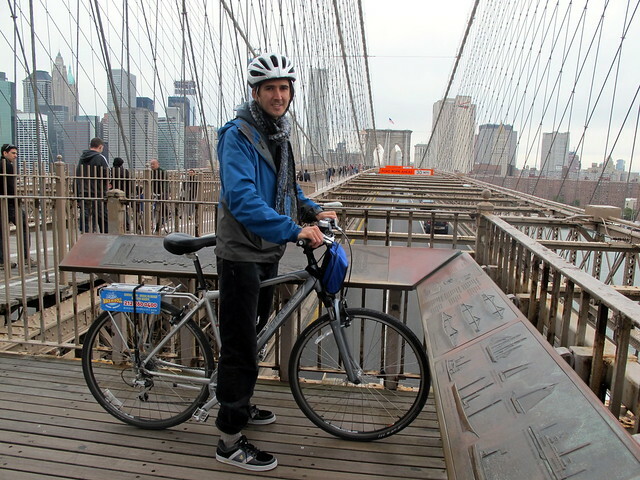 Things were a bit better once we got to the Brooklyn Bridge. 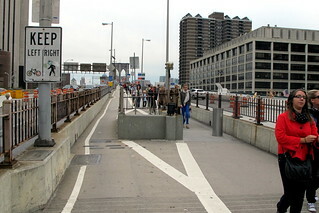 The bridge has a designated lane for cyclists, but it’s narrow and there are constantly pedestrians spilling into it. There was also more construction on the bridge, so the the first half gave us spectacular views of metal sheeting. 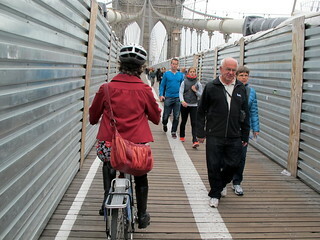 The one bright spot of our ride was the last stretch on the west side of Manhattan. 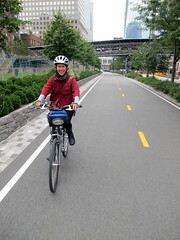 The West Side Greenway and Hudson River Promenade offered wide, smooth, uncongested bike lanes put smiles on our faces. 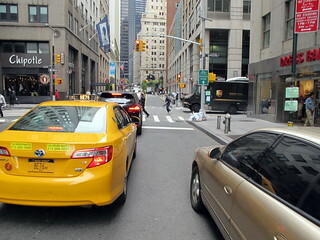 Maybe it was because we weren’t often out during rush hour, but there seemed to be less conflict between cyclists, motorists, and pedestrians in New York (compared to Vancouver), even though space is at more of a premium and we witnessed a lot more bad behaviour. 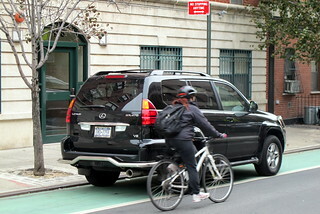 Pedestrians routinely darted into traffic, cyclists salmoned up bike lanes, and cars routinely parked in bike lanes. Yet, we rarely saw angry confrontations. I guess everyone’s a sinner in New York, so there’s no sense being self-righteous. More pictures available on Flickr.